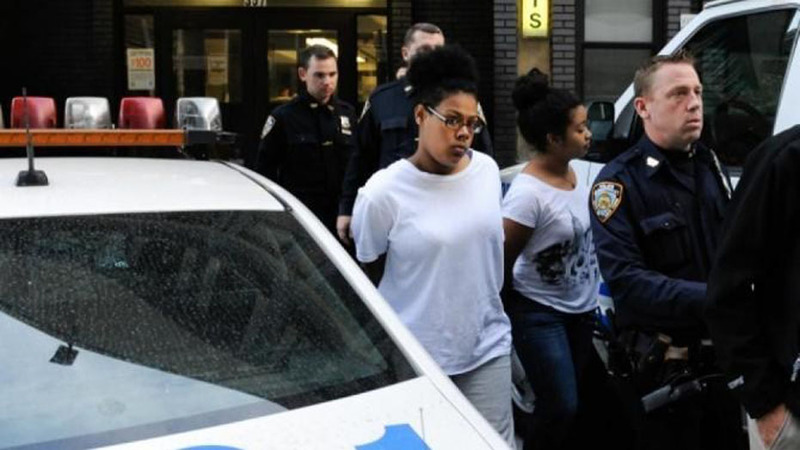 A New York City teen has been charged with murder nearly two years after she was found carrying her dead newborn son in a tote bag when she was stopped on suspicion of shoplifting in a Victoria’s Secret store. Tiona Rodriguez, 18, was indicted Thursday on a second-degree murder charge in the October 2013 death of her son, CBS News reported. “She knew she would be in big trouble if her family found out,” Ferrari said, according to the New York Daily News. “So, she made a plan to kill this baby,” the prosecutor alleged. Ferrari said that Rodriguez delivered the child in the bathtub of a friend’s house, ripped out the umbilical cord “with her bare hands,” and killed the baby boy. He weighed 8 pounds and had been carried full term, the prosecutor said. The medical examiner determined the child had lived for several minutes and died of asphyxiation, according to The New York Times. Rodriguez “took a break from that plan in order to stop in to Victoria’s Secret here in Manhattan and steal, shoving clothes into the same bag that carried her dead son,” Ferrari asserted. It was there she was stopped on suspicion of shoplifting and a security guard, smelling a faint, foul odor, dug into the bag and found the baby’s body, The Times reports. Ferrari said Thursday that the dead child was Rodriguez’s third. “When the defendant was 14, she successfully hid her first pregnancy, and it was only when she was in the hospital in labor that her own family became aware that she was even pregnant,” she said, according to the Daily News. That child is now 4 years old and being raised by Rodriguez’s mother, according to The Times. The whereabouts of the second child are unknown. Ferrari alleged the teen gave birth to that child in 2012 in the bathtub at her own home. No charges have been brought against Rodriguez in connection with the missing baby. Her attorney, Earl S. Ward, maintains the third baby wasn’t murdered. He said in court Thursday the child was stillborn. He added that Rodriguez was “a young and confused lady” who was still attached to her dead child and was trying to decide what to do with the body when she was stopped for shoplifting according to The Times. In December, a judge threw out the shoplifting charges against Rodriguez, saying prosecutors had waited too long to go to trial. Rodriguez, who turned herself in Thursday, was ordered to be held without bail by Manhattan Supreme Court Justice Thomas Farber. She has pleaded not guilty. If convicted she could face 15 years to life in prison.